Earlier this month, we were present at Oxford University Freshers’ Fair. The event was held in the historic setting of the hundred-year old Examination Schools and was attended by more than 10,000 students. 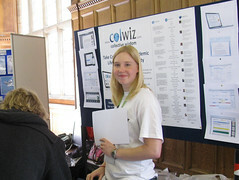 It was a great opportunity to meet new students and to talk to them about how colwiz can make their academic life easier. As part of the Freshers Fair, we were offering 3GB of free cloud storage for every new sign-up before the 31st October. Click on Full-Screen button to see a larger version.